You can see the robot age everywhere but in the labor statistics, I wrote a few months ago, channeling Robert Solow. The popular and often alarming predictions of a looming unemployment crisis, one that would stem from rapid advances in robotics, artificial intelligence, and other computer automation technologies, have become increasingly hard to square with the economy’s rebound to near full employment. If computers were going to devastate jobs on a broad scale, one would think there’d be signs of it by now. We have, after all, been seeing remarkable gains in computing and software for many decades, while the broadband internet has been working its putative magic for more than twenty years. And it’s not like a shortage of corporate cash is curtailing investment in technology. Profits have been robust and capital cheap. 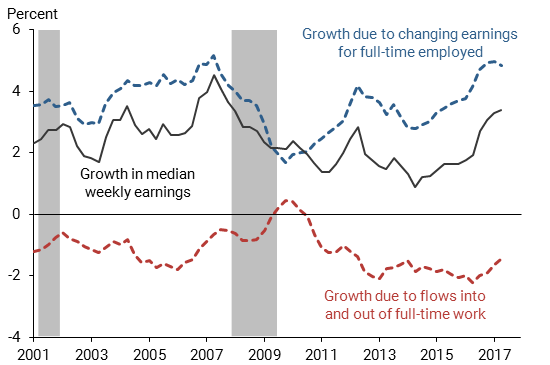 Still, even as jobs rebounded from the depths of the Great Recession, overall wage growth has appeared sluggish, at times stagnant. It has seemed possible that the weakness in wages might be the canary in the automated coal mine, an early indication of a coming surge in technological unemployment. If humans are increasingly competing for jobs against automatons, of both the hardware and software variety, that might explain workers’ inability to reap wage gains from a tightening labor market — and it might presage a broad shift of work from people to machines. At some point, if automation continued to put downward pressure on pay, workers would simply give up trying to compete with technology. The robots would win. I’m sure this research won’t be the final word on the complex issue of jobs, wages, and technological unemployment. But the findings do provide further reason for skepticism when examining claims that a robot horde is about to eat the job market. Postscript: In a new article in Wired, Andrew McAfee, coauthor with Erik Brynjolfsson of the influential book The Second Machine Age, says he now regrets the stress he placed on automation’s impact on overall employment: “If I had to do it over again, I would put more emphasis on the way technology leads to structural changes in the economy, and less on jobs, jobs, jobs. The central phenomenon is not net job loss. It’s the shift in the kinds of jobs that are available.” I think that’s right, but I’d add another concern that will become more pressing: the impact of automation on the structure of jobs themselves. Human beings and computers are going to be working together, more closely than ever, and we need to get the division of labor right. The “robots are taking over” rhetoric is a distraction from what’s most important about the second machine age. Image: still from Lost in Space. This entry was posted in Uncategorized on August 18, 2017 by Nick. Nick, I agree. My recent book Silicon Collar explored the impact of automation on jobs. I profiled practitioners in 50+ industries using robotics, drones, AI, wearables and most of them talked about how the tech is evolving, how expensive, how mature etc. In other words they were pragmatic. I then talked to a variety of academics and analysts and folks in SV. They were hysterical about how many tens of millions of jobs are about to be lost to machines. To reconcile the two extreme viewpoints, I then studied a century of automation. I found UPC scanners first patented in 1952 still have not killed grocery jobs, ATMs first introduced in 60s have still not killed teller jobs, and many more examples. That made me look at societal “circuit breakers” which slow down adoption of automation. Folks say this wave of machines is way superior. Yes, tech is accelerating, but adoption is not. Automation replaces individual tasks not complete jobs. It ends up morphing jobs and making workers smarter, speedier and safer. If anything we should be worried about humans harming the jobs economy – we have 5+ m unnfilled jobs wand over 1.5T in student debt. That msimatch is entirely blamable on humans on machines. one concern I have is that AI will further encourage the culture of death. The robots are taking our jobs hysteria translate that humans are not needed. Because people keep reproducing and there’s not going to be anything for them to do – we will need to either have a big plague or a big war to keep the numbers down or come up with some new technology to sterilize people without them knowing it. This is the dangerous thinking that fills the heads of some at the top these days. We need a more noble and moral mindset – new technology that will unleash the capacious nature of man and create new and numerous employment frontiers that will create robust and rewarding opportunities for all sectors of the world. we need God’s help to accomplish this yet we never talk nor invoke this divine aid collectively and publicly – why not?